Having graduated with a Bachelor in the School of Arts and Crafts of Madrid, in 1985 Juan Carlos Morel began his career as an interior designer in Madrid where he lived and developed his projects for four years. He moved to Marbella in 1989, where he established his show-room. This is where he currently focusses his work as a decorator, along with his team of professionals whom are specialized in the decoration sector. His studio functions for the realization of both national and international projects. 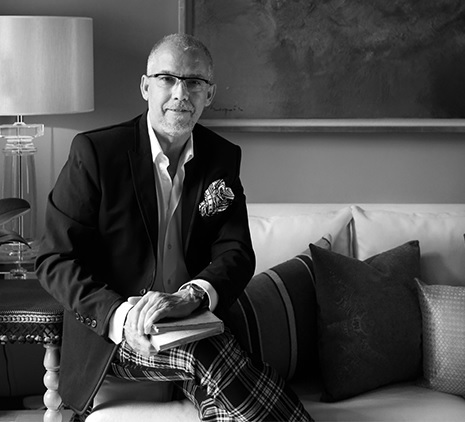 Juan Carlos Morel has carried out international projects in predominantly London, Casablanca, Paris, Miami, the Dominican Republic, Newcastle and the Bahamas. His projects transmit a sense of calmness in a contemporary environment mixed with a classic touch. Juan Carlos Morel has experience of more than twenty-nine years making integral projects of Decoration, Design and Interior Refurbishment. Our professional profile and that of our clients allows us to work with the best firms in the world of decoration. Moreover, we have a team of professionals that allows for the realization of fully customized projects. Licenciado en la Escuela de artes y oficios de Madrid, En 1985 comienza su trayectoria como interiorista en Madrid donde reside y desarrolla sus proyectos durante cuatro años. Se traslada a vivir a Marbella en el año 1989 donde se establece abriendo su show-room. Aquí es donde se consolida como decorador, junto con su equipo de profesionales en el sector de la decoración. Su estudio funciona a día de hoy para la realización de proyectos nacionales como internacionales. Juan Carlos Morel ha realizado proyectos internacionales en Londres, Casablanca, Paris, Miami, República Dominicana, Newcastle y Bahamas, principalmente. Sus proyectos transmiten calma en un ambiente contemporáneo mezclado con el clásico. Juan Carlos Morel cuenta con un bagaje de más de veintinueve años realizando proyectos integrales de Decoración, Diseño y Acondicionamiento de Interiores. Nuestro perfil profesional y el propio de nuestros clientes, nos lleva a trabajar con las mejores firmas del mundo de la decoración. A su vez, contamos con un equipo de profesionales que permite la realización de proyectos totalmente personalizados. Functionality and aesthetic sense is reflected in the realization of this project, where the natural color and contrast in tissues and hardwoods merge to create this space. The mix of contemporary styles with classic touch on some of the parts used and the contrast of modern painting make the stay relaxing and in turn has its criteria of elegance and comfort.